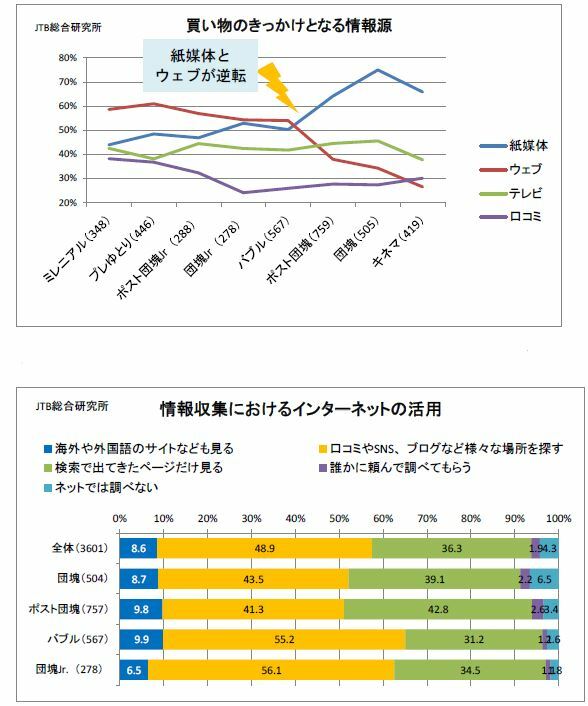 JTB Tourism Research & Consulting Co. conducted the survey on seniors’ lifestyles and travel targeting the post-baby boomer generation from 57 to 65 years old and the bubble-economy generation from 46 to 56 years old. For a question of ‘what to spend money and time,’ internet was No.1 with a share of 70% or less each in both the generation. Interestingly, a share of online payment experiences reached 96.3% for the bubble-economy generation and 94.3% for the post-baby boomer generation, and they purchase a variety of items such as books, appliances or local foods. Also, more than sixty-percent of both the generations have experienced online bookings for travel products including accommodations or package tours, and the ratio was much higher than that of bookings in real shops (12.7% for the bubble-economy generation, 13.1% for the post-baby boomer generation). As far as information sources for shopping are concerned, there were differences between each of the generations. 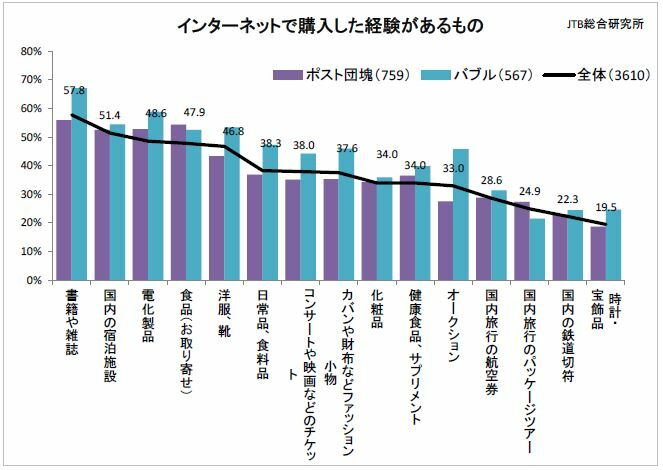 The survey finds that the bubble-economy generation tended to use online including word of mouth, SNS or blog more frequently than paper media for information gathering, and the ratio reached 55.2% of the total. 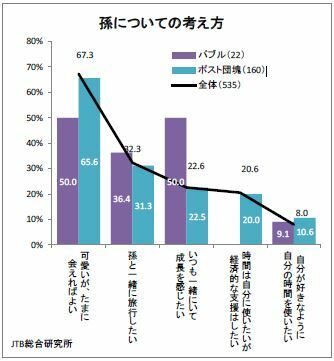 For a question of ‘what to want to spend money and time in the future,’ the top answers were ‘overnight trip with family (37.9%)’ among the post-baby boomer generation and ‘daytrip with family (34.3%)’ among the bubble-economy generation. A largest share of traveling companion was a wife or a husband (66.5% for the post-baby boomer generation, 59.8% for the bubble-economy generation). A share of ‘hope to travel with grandchildren’ was 30% for both the generations, and a share of ‘hope to stay together with grandchildren to see their growing’ particularly reached 50%. The survey result finds that traveling with grandchildren is a promising market for next generation seniors as well, according to JTB Tourism Research & Consulting.